Hi my name is Kellie Ryan, I am Mark ‘Dutchy’ Ryan’s sister. 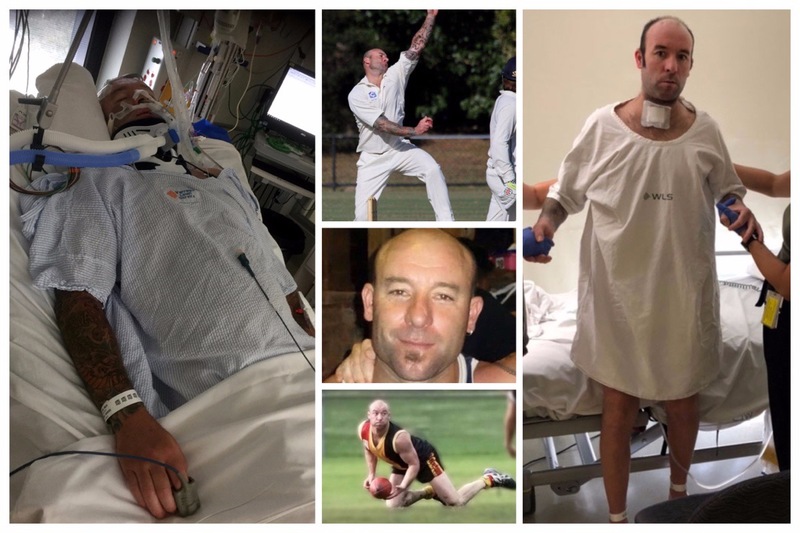 Myself and the family want to help Mark rebuild his life and support him after a devastating and tragic accident. Mark ‘Dutchy’ Ryan is a loveable larrikin. He is a sport-loving, hard-working, determined, courageous, gutsy and funny as hell, father of two boys. On Monday, January 14, 2019 at 4.50am, Mark was driving to work. Whilst driving through an intersection his car was hit by another car, containing 6 youths. Travelling in excess of 100kms and running a red light, Mark wouldn’t even have seen it coming. And just like that, in an instant, life as he knew it would be changed forever! Mark was rushed to The Alfred Hospital, Melbourne, Victoria for emergency surgery. The surgery was to relieve a sub-dural bleed on the right side of his brain. Mark was placed in an induced coma, occupying a bed in the ICU for 4 weeks. These were the types of comments and questions we were delivered in those first 2-3 weeks. With very little, if any positive feedback or prognosis all we had was hope, prayers and faith in the knowing that Mark was a fighter and would be giving it everything he had. Mark is one of the most determined, tenacious, gutsy people we know and if there was any way at all that he could get through this he would find it. 4 weeks in ICU, then 5 weeks in the neuro ward, he now has a bed at the Acquired Brain Injury, Rehabilitation Centre (ABI) in Caulfield. We have visited him every day and watched step-by-step as he works tirelessly to re-build his life. He has made so much progress but with any brain injury and especially one like Marks which is known as a Diffuse Axonal Injury (DAI) where the damage is scattered in several parts of his brain. The road/path/journey is a long and arduous one, with no guarantees of recovery. He is having to re-learn everything, breathing, swallowing, eating, walking, bathing, talking, toileting training. And if he does re-learn all of these things to a satisfactory level, it is uncertain whether he will ever be able to work again, drive again or play sport again. It will be sometime before we know what his cognitive ability will be. We want to help change Marks life! We are looking to raise money to support Mark’s quality of life. We want to raise money so that he will have choices, independence and options. There is so little known in regards to recovery and outcome from severe Traumatic brain injuries. We want to be able to provide him with the best possible specialist care to maximize his recovery. Mark is a fighter. Help Mark win his biggest battle yet! 100% of all monies raised will be utilized solely for the purpose of maximizing Mark’s recovery, independence and for his future security. We would like to continue to thank all the people who have donated so generously to Mark's recovery so far. As we mentioned in the previous update, the response has been truly overwhelming and we cannot thank you all enough for your generosity and support for Mark. Please continue to check the updates section of this page for progress on Mark's recovery to which you're all assisting greatly. We would like to thank all the people who have donated so generously to Mark's recovery so far. The response has been overwhelming and we are truly grateful - thank you! We would like for all of you to be fully aware of where your generosity and support for Mark's recovery is being directed. All of the monies raised for Mark will be used following the guidelines stated in the Terms and Conditions listed on the Go Fund Me Website. His funds will fall into the categories of medical and emergencies. Whilst TAC covers a lot of his requirements, there are a number of things it does not cover. The purpose of this fund is to maximise Marks recovery and to provide him with choices, independence and options. We want him to have the best level of care throughout his recovery and sometimes that means thinking outside the box, utilising therapies and methods of treatment that aren’t covered by TAC. 100% of this fund will go to Mark to ensure his future, general life needs and to make sure he has not just an adequate quality of life but a great quality of life. He will also need help and support to provide for his boys and the life he is trying to rebuild for them. Please feel free to contact me personally if you have any specific questions regarding Mark's recovery and this fund to support it.